I have used the Greenhouse Garden again, I just can't help it those flowers are beautiful and lots of you think that as I have sold 18 sets this month, (my target is 20, so hopefully will achieve that). Now for the background I have used the Paisely stamped in More Mustard over Confetti card stock and En Francaise big background stamped in Creamy Caramel and over that I have used the big flourish from Baroque Motifs in Mellow Moss ink. It all came together very quick, it was so much fun to keep stamping on top of other backgrounds, but I didn't stop there I added a lot of splattering on top for good measure and some tearing. I love the end result. The Mellow Moss layer had the sentiment stamped on and the whole piece was splattered and torn. The flowers stamped in Bashful Blue and Brocade Blue were decoupaged and arranged on the front and the whole piece was added to a Chocolate Chip base. Bashful taffeta and Mellow Moss taffeta were the ribbons used and of course flat pearls and crystal beads were added from the Pretties kit. I hope mum will love it as she likes flowers so I cannot wait to see what she makes of it. I went to buy some clothes and ended up buying a travel bag ?????????!!!!!!!!!!!!! I couldn't resist it though how gorgeous is it? By Ted Baker bought it in Boots and I simply adore it. I didn't need a new one but it screamed BUY ME so I did. 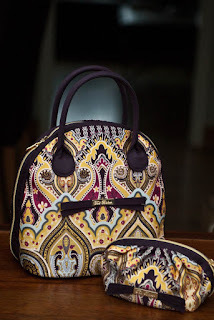 Of course I had to have the matching little purse as well, click on the picture to make it bigger the colours are just gorgeous. Right I am off, my sis is coming with little Luca today for a long weekend and I cannot wait I am counting the minutes away. I have plans of getting him to stamp for the first time....aaaaaahhhh. Eine wunderschöne Vintage Karte. Superschön gestaltet! Love the Card, can't wait to get my stamp set, its so good. And I so want that wash bag. and your bag is just beautiful must go and have a peak next time i am shopping!! Love this card - just need my stamps now to try and CASE it! LOVE LOVE that bag - keep close hold of it when I am around LOL! Your card is beautiful, I have to admit I struggle with vintage too!! I love your card Monica. I have just realised too how beautiful the flowers are. love the colours you have used. Thank you for saying such kind things on my blog :). 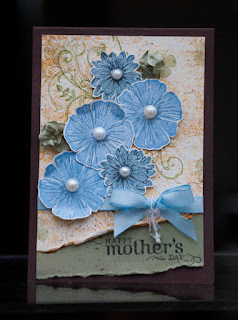 Monica, your card is beautiful, I love that bashful blue colour. And the baroque swirls stamp is my favourite, it's so versatile. I've been trying the vintage look too but can't quite get the hang of it. Your bag and purse are gorgeous! fab card and gorgeous bag - well shopped that woman! Absolutely love the card it's beautiful, your mum is going to love it:) And the bag, well, I want one too!!!! Wow Monica I love your creations and your blog. I couldn't quite believe that someone so creative as you would be following my measly blog - still can't quite believe it! What an awesome & beautiful card Monica...tfs!!! wow lovely card Monica, and you wont believe it but i have the same bags!!! i saw them and had them for xmas! !